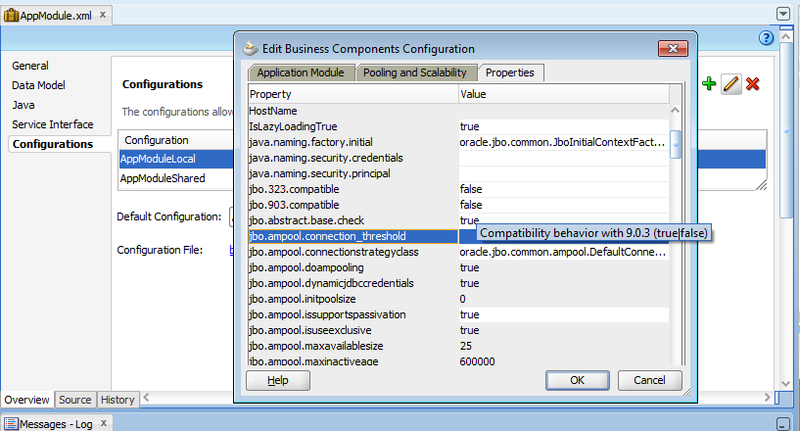 If you have seen application module configuration parameter editor in JDeveloper 11.1.1.7.0 release, you might have noticed a new property jbo.ampool.connection_threshold. Wondering what is it? Well, this in an 'internal' property(NOT for public use at this moment) which has been introduced to avoid the overhead associated with normal connection pooling. In normal case when connection pooling is ON, framework will close all opened cursors at the end of a request and then will restore the state during next request. This creates some sort of overhead especially when you have partially fetched result set( for example data fetch caused by UI like scrollable table). 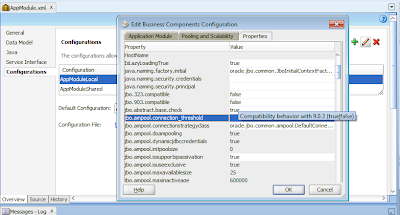 The new parameter provides a way for users to strike an ideal balance by releasing JDBC connections only when a certain threshold is reached. This property defines maximum number of JDBC connections that all AM instances can hold without releasing them to pool on AM check-in. Once the connection threshold value is reached least recently used connections are released back to the pool during next clean up cycle. Where Can I set this parameter? What is the recommended value?